SEMCOR is a leading supplier of flexible electrical conduit in a variety of materials, lengths and protection schemes. 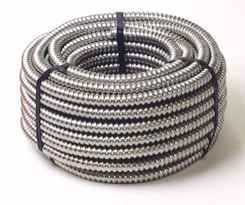 Whatever your requirement, we can supply the right flexible electrical conduit. We’ve been in St. Louis, Missouri since 1907 and are a trusted name for Midwest needs of any hose type. Our expert staff sources the best across industries and manufacturers to offer you the right part at a budget-conscious price. If you have a special need or an emergency, we have sales and service personnel available 24/7 to help. Flexible wiring conduit and even PVC options can serve as electrical conduit in industries all across the United States. Open a wall, control panel or advanced part and you’re likely to find an electrical conduit hose. It’s prevalence provides all of us with excellent protection. Anamet Electrical. Anamet Electrical, Inc., provides a variety of flexible, electrical conduits with a significant focus on protecting wiring. Common Anamet applications include support for machine tools, computer wiring, nuclear power plants, mass-transit vehicles and more. Hose Master. Hose Master offers a series of electrical conduit and flexible protection platforms designed to handle a variety of industrial applications, with a main focus on vibrations, temperature derating and expansion. At SEMCOR, we are committed to providing service and products that pass a series of quality checks. We know the goods we provide can make the grade because we’ve reviewed all of our electrical conduit. If you have a special case or need emergency service, please contact us right away for assistance.